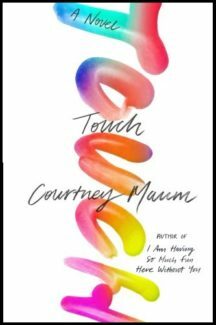 Courtney Maum’s second novel, Touch, is a wickedly smart story about technology’s pervasive hold on our lives—and about what makes us most human. Sloane Jacobsen is a 39-year-old world renowned trend forecaster. (Yes, this is a real thing; Maum herself has worked as one.) She has just started a six-month consulting project at a progressive company in Manhattan, charged with planning ReProduction, a summit to celebrate the voluntarily childless. Having been called “the Ultimate Anti-Mom” by British Vogue, Sloane seems to be the perfect choice for the job. She has said that breeding is “akin to ecoterrorism” and is in a childless relationship of her own with Roman, her unconventional French boyfriend. Sloane is a flawed and plucky heroine who carries Touch from its first page to its last. The circumstances surrounding her may be peculiar (think driverless cars and Zentai suits), but she is exceedingly relatable as she tussles with big, universal themes like sisterhood, loss, empathy and attraction. Her emotional growth as the story unfolds is gripping—so much that it’s difficult to let her go when the story ends. Like her first novel (I Am Having So Much Fun Here Without You), Touch is written in Maum’s vibrant, impeccable prose that hops and skips off the page, begging to be read (and re-read). Wondrously, she has crafted a clever social commentary that manages to be warm and soul-stirring at the same time. Maum clearly understands society’s addiction to screens—“The humans were so tired… It felt like the only thing that people wanted was to stay alive and order takeout and play quietly with their phones”—but in writing Touch, she offers us the chance to put away our devices and get lost in the purity and magic of a ridiculously good book.